Mr. French did a great job of going out of his way to make sure I had a positive experience. I will be using COX for all my service work in the future. I was on vacation and had a serious problem with my new Traverse (power transfer case). Matt Winslow, my service consultant, ensured there was no reason to worry the car would be fixed in a timely manner. Matt, followed through with his promise the car was fixed and I was able to drive it back to Michigan. Matt also arranged for me to have a courtesy car so my family wasn't stuck in the hotel while my car was being repaired. Everyone at this dealership was amazing. I walked in just to look at a specific vehicle. Larry as a manager helped me out because everyone else was with customers. He grabbed the keys and talked to me about the car. We sat to talk some numbers. At that time Tony H. became available and took over. Tony stayed all day to help us out. Steve in finance did a great job finding us a great rate and keeping our payments in range. I will definitely be buying another car from these guys. Best experience ive ever had at a car dealer. Thank you gentlemen. Steve Himmel in Finance is AMAZING. He’s fast, efficient, humble and kind! He made my buying experience very easy and helped me to make decisions with a clear mind. What a great team there at Cox Chevy! 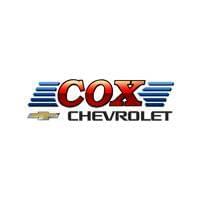 Just bought my 3rd car from Cox Chevrolet! Love the welcoming feeling, the knowledge and expertise from this dealership. Our Finance manager Damian Destefano went above and beyond to meet our needs. I would recommend him and Cox Chevrolet/Mazda any day! Great service. Very professional and friendly. Service was done on time and done quickly highly recommend. Had a lot of questions about my new truck , all of my questions were answered , my adviser was very helpful , professional and personable. I feel he went above and beyond to make me feel comfortable and satisfied with the answers that he provided , I needed to be shuttled back and forth to my house and Elmer did a great job very personable and got me back and forth quickly and safely .